THE Australian Paralympic Committee has officially announced this year’s Paralympic equestrian team, which includes Scone rider, Lisa Martin with her horse First Famous. Ms Martin said she was busy putting a horse away when she kept hearing her phone ring in the wash bay. Lisa Martin riding First Famous as a grade IV para rider at Boneo Park, Victoria. “I kept hearing my phone go off and wondered what was going on, it is such wondering news,” Ms Martin said excitedly. “It feels unbelievable to have been selected to represent Australia at the Paralympic Games,” said Ms Martin. “Competing at the pinnacle event of your sport is a wonderful opportunity and experience not many people have,” she said. 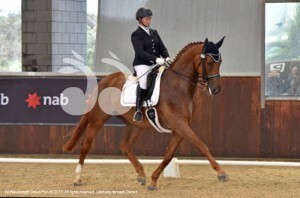 “First Famous is a German Warmblood mare; she has the most amazing temperament, and is a really special horse. “The next thing I will do is have a Rio party, because I’ve had to put my friends and family on hold for so long, so now I am looking forward to that,” she said. “In terms of training for Rio, I will keep doing what I am doing, if it’s not broke, don’t fix it,” she said. “It feels unbelievable to have been selected to represent Australia at the Paralympic Games,” Lisa Martin said. Ms Martin said she aims to score more than 70 and aims for a personal best; she will depart for Rio on August 2. Read how Lisa’s became a Paralympian: Second in Line for Rio. Kate McLoughlin, chef de mission of the 2016 Australian Paralympic Team sad she hopes the equestrian team will grow the medal tally in Rio. “I would like to congratulate Lisa on her selection to the Australian Paralympic Equestrian Team. It is an honor to represent Australia at the peak of Paralympic sport, and Lisa should be proud of her achievement,” said Ms McLoughlin. “Lisa is an outstanding trainer and rider and I look forward to seeing her ride at her Paralympic debut,” she said. “Australia won gold in Equestrian for the first time at an away Paralympic Games, and I hope to see our success continue in Rio,” Kate McLoughlin said. The Rio 2016 Paralympic Games will take place from 7 September through to 18 September, 2016.